Backflow preventers are installed to stop the reversal of water flow from a contaminated source to potable or clean water supply. These devices are designed in a specific pattern to enable the flow of water in a definite direction. They are important inclusions to sanitary sewer lateral which minimizes risk of backflow of water due to obstruction in the main sewer line. Sewer backflow preventers are also known by names like backwater valves and check valves. What are the types of backflow preventers? How does a sewer backflow preventer work? In normal condition, the flap remains in a relaxed position. The valve or gate stays open to let the water pass through it. During the circumstances when water start flowing backwards, the flow raises the flap which is below the gate. This creates the hindrance which prevents the flow backwards. With prolonged backflow, water levels force the gate to shut thereby creating a mechanical seal. This seals off the place and stops water flow towards the back completely. The function of this gate ends when the flow reduces and water backing ends. It collapses to its original position due to the pull of gravity. This allows normal sewage flow to resume again just like before. Backflow preventing devices are integral to any construction as per building codes of a locality. In case your sewer system is devoid of this device, you can easily get one installed with a plumber or even on your own. A backflow preventer is required if the location of your plumbing system is not even a foot above the closest rising sewer manhole. Even when you have the plumbing system underneath the cleanout, you need to install SBPDs or sewer backflow preventer devices. These devices are mostly installed on the sewer main’s lateral. First of all take the measurements of the body of the backflow valve for length. Now, determine the location of on the main sewer line on which the valve will be installed. Next according to the length of the valve already measured, two marks have to be made on the pipe. Opt for a handsaw and make cuts at the mark on the main sewer. Make sure that they are parallel and in a straight line. Use a knife to smoothen the ends of the areas cut out. Now, take a wet rag and use it for wiping the exterior of the cuts on the pipe. Apply PVC primer on the exterior of the areas cut out, properly. Then put primer in the ends of the backflow valve from inside. Next step would be to apply PVC cement on these regions where prime was applied. 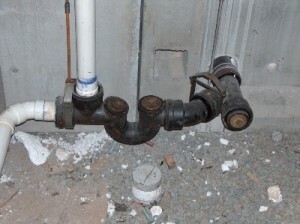 As soon as it is done, immediately insert the ends of the sewer pipe into that of the backflow device. While doing this, make sure that the direction of the flap will be similar to the direction of the flow. Do not leave it quickly; instead hold on for 10 to 1 seconds for it to dry. Even though this can be done alone, a professional can be employed for flawless execution fo the task. Besides, it is important to know several codes in this regard for installing BPDs, which a professional would know apart from the permit. It should also be inspected to confirm the installation correctly. Exact adjustments should be followed while installing the devices. Every device includes well-defined direction which should be followed to derive full functionality from them. Location of the device must be considered as well. It should be located below sanitary fixtures but above the foundation drain. 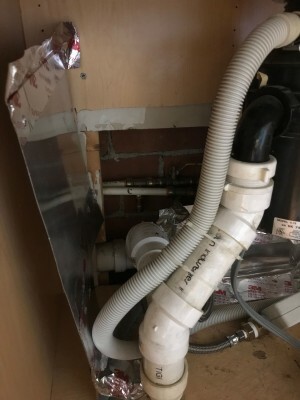 It is better to break the connections between the sewer and foundation drain. Some amount of sloping is required during installation. Without this, the device might not function correctly. Prices of sewer backflow preventers vary between $1,500 and $3,500 approximately. There are several companies adept in providing maintenance of BPDs at affordable costs. These skilled personnel carry out installation of such devices and help protecting homes from flooding. Opt for the sewer inspection services which can be availed at $50 and more. This ensures professional assistance for a clean home. Maintenance of these BPDs can save you from a list of problems arising out of it. These mechanical things require regular maintenance as they tolerate the dirt in the sewage line. One should check the recommendations of the manufacture while cleaning them. To make sure that they work effectively during backflow situations, it should be cleaned on routine. You can avail backflow preventers from the public works department of your city or also get in touch with sanitary district for added information and help. Contractors having valid license should be contacted to lessen chances of mishap due to the installation of these devices. After considering these options, it is crucial that you also understand about the situation which would arise when backflow valve closes down. No matter how effective this might sound to prevent backflow, the downside is that sewage cannot escape from your house. It might create a mess in your house, especially in the basements shower areas. Hence, a degree of consciousness is required to safeguard yourself form such miseries. Thank you. Your article explains very clearly about all of the what, why and how of backflow preventers. When we started to look into constructing our home, this is one of the things that cropped up and I wasn’t too sure about what it was, what was involved and how it worked. Now I have a better idea. It’s interesting because this is not something that I had even given a thought to earlier. Every day, ever since we made our decision to construct, I am more and more amazed at the new things I’ve been learning about that I did not even know existed. Of course, now I have to find an efficient plumber in my area and this is one more thing I will need to add to my list of things to ask the plumber. Thanks again. Your article has been extremely helpful to me.